Thanksgiving has long been my favorite holiday -- in my life, it's always been a time to treasure community -- whether that be friends, family, new acquaintances, or a mixture of all of the above. For quite a few years, we spent Thanksgiving away from immediate family, but were always priveleged to break bread with friends old and new. Through the years, Thanksgiving activities have included playing games, busting out the Christmas movies, football, and lots of good food. This year in particular, Thanksgiving resonates with me because I've been reminded in recent weeks the importance of living a life of gratitude. Trying to be constantly aware of what I have to be thankful for, in a humble, pay-it-forward kind of way. 1. Jeremy and Christina. Motherhood is a wild ride! When people ask, I say it's the hardest and best thing I've done to date, and I'm sure that will only get more true. And I'm so, so thankful to be on this adventure with Jeremy. He's the best person to have an adventure with. 2. Technology. Phone calls, texts, emails, Skype, even Facebook help me stay in touch with friends across the country, and have even helped me make friends with people I'd never have met otherwise. 3. Our neighborhood. I'm grateful to live in a neighborhood that is nice to get out and walk in. Trees, sidewalks, and a playground only 15 minutes away. We have really nice neighbors on either side of us, and it's just great to be in a place that feels homey. 5. The little things. Earlier this year there was a little Facebook challenge going around: list something you're thankful for for 5 days, and challenge three people to do the same each day (a warm up to thankful Novemeber maybe?). One thing I loved seeing was all the "little" things people were thankful for: coffee (ummm...yeah), music, nail polish, books. It's fun to step back sometimes and recognize that some seemingly small thing can bring so much enjoyment to my day, or even just this moment. Baby giggles, fresh baked bread, a walk around the block, a beautiful sunset, a fun t.v. show, quiet time, friend time, a game of cards, a phone conversation, or even a box of tissues (which I am so thankful for today. First cold of the season, anyone? Thank you for sharing Christina). It's no secret that I'm a big Maggie Stiefvater fan, and I am really digging her latest series The Raven Cycle. Blue Lily, Lily Blue is the third book in this planned quartet and as always leaves me pacing my house longing for the next book. Y'all. These book are so good. 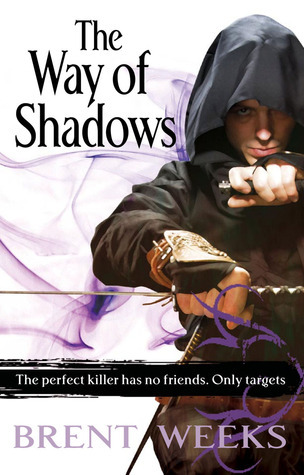 Magic, friendship, Welsh mythology, good guys, bad guys, and very gray guys (Literally. The Gray Man is the epitome of morally ambiguous character.). When I first discovered Stiefvater's books, I told a friend that her writing feels like a painting in words, and that is still true in this book. So. The plot moves forward, and our band of four guys and a girl stir up some serious magic. Individually, the teenagers seek out those universally teenage things: figuring out who they are, where they fit in to the world, and what really matters to them. Collectively, they have weathered some storms and come out closer and more appreciative of each other. The plot begins to draw in, and you can see storm clouds on the horizon. I'm not saying much concrete about the book on purpose, because this is definitely the kind of story to start at the beginning. And if you haven't yet, pick up The Raven Boys and settle in. Rosalee double checked the cart of books that put in order, then glanced at the clock. Thirty minutes until closing, just enough time to get these books shelved. She wheeled the black metal cart from behind the desk and headed to the chapter book section of the children’s room at the library. Things were pretty quiet this evening – Mondays often were. Rosalee loved this little library. There were two public libraries in town now, but this was her favorite. It had originally been just a converted old farmhouse. Eventually, the town had added on a nice, modern building, but had left the farmhouse. First floor was now a coffee shop, and the second floor housed offices and administrative staff. Sometimes Rosalee would come to work early and treat herself to a pastry and cup of coffee at the coffee shop. Jessica had even worked there for a while in high school. Carolyn, the full-time children’s librarian, was laying out material in corner, prepping for Tuesday’s regular story-time. That corner of the room was slightly sunken, with three steps leading down to a good-sized wedge-shaped area with a rocking chair at the point. A pile of pillows sat along one wall. Sometimes the kids pulled them out for story-time, and sometimes they’d just pull them out and read for a while when nothing else was going on. A low table lined the other wall, where Carolyn or one of the other librarians would set up crafts. Some front facing book shelves were built into both walls, providing a place to display books relating to that week’s story-time theme, or just books the librarians wanted to display and highlight. Stephanie, one of the other part-time staff, was at the desk in the opposite corner doing some work on the computer. Rosalee was about half-way through shelving her cart when Stephanie looked up from her work and called out. Rosalee turned toward her. “Well…” she said, her first instinct to politely declinje, although she wasn’t sure why. “Actaully,” Rosalee said, “that sounds great. I’d love to.” After all, she thought to herself. What plans do you have. None, that’s what. And weren’t you just thinking the other day that you had become a hermit? She finished shelving her cart of books while the other two began getting everything in order for closing. Twenty minutes later, Rosalee was climbing in her car to calls of “see you there!” and pulling out onto the relatively quiet street. She smiled to herself, looking forward to a nice dinner with her coworkers. She made a quick stop on the way at a dollar store, grabbing a cute birthday card and gift bag. At the restaurant she took a moment in her car sign the card and put the bag of coffee she’d purchased that day into the gift bag. It’d been an impulse buy – she’d had a thought of giving it to Celia Blair. But she could always buy another bag; she knew Beth liked coffee as well – she always had a mug in her hand – so it worked out nicely. Rosalee was the last to walk in, but the other ladies were still taking off sweaters and jackets. They’d snagged a table against the wall, much preferable in Rosalee’s opinion to sitting in the middle of the room. She set her purse down in an empty chair, then dropped her small bag in front of Beth’s place. “Happy Birthday!” she said, leaning in for a quick hug. Rosalee moved back down the table a few chairs to her own spot and, after a quick check to make sure the hardwood floors weren’t too grimy, slid her purse under her chair. There were six ladies of varying ages around the table. Alysia, head of information services, Donna from technical services, Beth, Stephanie, Caroline and Rosalee. Rosalee was pretty sure Donna and Caroline were around her own age, Beth and Stephanie in their mid-to early 40s, and Alysia somewhere between 25 and 35. Rosalee was terrible with ages. She only guessed Beth and Stephanie’s because she knew how old their kids were. Either way, it was a comfortable group. Everyone except Rosalee had been working at the Woodson Public Library for at least 10 years. Rosalee had only been at the library for a couple of years, but the staff had been more than welcoming. This was the first time she’d ever accepted any offer for out-of-work socializing though, and she found herself to be a little bit nervous. But, as she’d been realizing more and more lately, it’d been a long time since she’d done any kind of non-family related socializing. Which, since she genuinely enjoyed the company of her co-workers, was one reason she’d said yes to the invitation. Rosalee gave herself a little mental pep talk and picked up her menu, glancing around the restaurant as she did. She’d never been to Brick Oven before, although she heard various members of her family talk about it all the time. The décor reminded her a bit of a pub – lots of dark wood, warm light and high-backed booths. Since the restaurant had the benefit of being a stand-alone building, there were a lot of windows. Rosalee could imagine how bright and cheery it looked in the daytime, but with no less warmth. There was a long bar at one end of the building, and behind the bar you could catch a glimpse of the big wood-burning pizza ovens. She glanced down at her menu, then turned to Caroline, who was sitting beside her. Their server arrived a moment later and took drink orders. Rosalee heard Beth ask who was driving her home because she was definitely planning on some birthday drinks. Rosalee laughed along with the rest and joined in the general conversation about wine and beer preferences and which pizza they were all going to order. She and Caroline ended up deciding to split a pizza, and before too long their waiter had slipped off to place orders and conversation turned to other topics. “So, Rosalee have you always lived in Mapleview?” Caroline asked, taking a sip of her red wine. “No, my husband and I moved here not too long after we got married. I grew up in Carrolton,” Rosalee answered. “What about you ladies,” Rosalee said. “Who’s from around here?” All but Donna admitted they’d grown up in Missouri, if not in Mapleview. Donna had moved to Mapleview with her husband’s job. They’d both grown up in California. Rosalee raised her eyebrows. “That must have been quite a culture shock,” she said. She looked at Caroline with new eyes noting the sleek and expertly colored hair, easy but flawless makeup, and casual but stylish clothing. She could see it clearly – Donna may not have lived in California for 15 years, but she exuded West Coast. Rosalee felt proud of her home state. “So what have you all been reading lately?” Stephanie asked, shifting gears. Caroline mentioned an author Rosalee had never heard of – not too surprising since she tended to stick to mysteries and historical fiction – but she made a mental note to branch out. “What did you like about the book?” she asked. Donna asked her if she’d read a certain author and the women around the table kept up an animated discussion about books and authors until the pizza arrived. Rosalee breathed deeply, enjoying the variety of scents coming from the table. Garlic and tomatoes and savory meat. She smelled the tang of barbecue sauce from the barbecue chicken pizza that Donna had ordered, a smell that Rosalee would have expected to seem out of place. It all smelled delicious, though, savory and rich. Her stomach growled and she and Caroline laughed. “I didn’t realize I was so hungry,” Rosalee said. The women continued to chat as they pulled slices of hot pizza from the oversized plates in front of them. The waitress refilled drinks and took orders for new ones. Rosalee took a bite of pizza – the crust was thin and crispy, with an almost grilled flavor that she assumed came from the wood-burning oven it had cooked in. She and Caroline had picked simple toppings –tomatoes, proscuto, spinach and fresh mozzarella. It was amazing. They all laughed and Rosalee lifted her piece for another bite. She glanced around the table as she chewed, a slight smile on her face. She was so glad that she’d accepted the invitation. Clearly her homebody ways were starting to lose their appeal because she was having a lot of fun, more fun that usually had on a Monday night. She was turning her attention to a funny story Beth was telling when she felt someone walk behind her chair and pause. Rosalee froze, her hand halfway to her face, her mouth hanging open. No one had called her Rosalee Barnes in a long time. And she hadn’t heard that voice in a very, very long time. Rosalee set her half-eaten slice of pizza on her plate with a trembling hand, and wiped her fingers on the napkin in her lap. She placed the napkin on the table, and slid her chair back. She could see the other ladies glancing behind and above her head then back at her, and she could see them wondering why she still hadn’t responded, why she was taking so long to say anything. Her knees joined her trembling hands as she stood up, then turned around. She willed her body to start cooperating, and cleared her throat before smiling. The eyes that smiled back at her were exactly the same midnight blue as they’d been in 1964. The smile lines that crinkled in the corners were deeper and more numerous, but Rosalee noted the same straight nose and strong chin, the same confident grin and lopsided dimple, and the thick blonde hair that had turned a beautiful silver. George was dressed casually in dark jeans, brown leather loafers, and a white button-up shirt with a navy pin stripe and the sleeves rolled up. As she reached out to meet George’s outstretched hand with her own, Rosalee also noted that he had clearly been taking care of himself as he was as trim and fit as he’d been 50 years ago. Men, Rosalee thought, instinctively sucking in her 62-year-old-post-child-bearing belly. The bastards. “Ghost…yes, that sounds about right,” she kept a smile on her own face, but inwardly cringed at her response. Her brain felt like that time she and Betty’d gotten her daddy’s car stuck in the mud down by the creek. They’d spent 20 minutes spinning those tires. “So, how long have you lived here in Mapleview?” George was asking. The question sounded wrong, and slightly accusatory to her ears, but if George thought so he didn’t let on. He just kept on smiling. “Early retirement. Wow, that sounds nice.” Brilliant Rosalee, she thought to herself. He’s going to think you’re getting dementia. “Mmm…,” she said, nodding. Rosalee’s sluggish brain was suddenly aware that she was standing in a crowded restaurant, having an unsettling and highly personal experience. People were weaving around them, and although she could hear that the ladies behind her had continued their conversation, it seemed muted. Like they were talking to give her privacy, but kind of wished they were listening in. She didn’t blame them…she’d be curious too. “I was going to call you next week,” George said. Rosalee raised an eyebrow, “Really,” she said. Finally, George looked less than one hundred percent at ease. “No really,” he said. “I called my cousin before I left Chicago. He still lives in Carrolton, so he was able to get your number for me from Betty.” He reached into his pocket and pulled out a business card. “See,” he held it out. Written in slanting print was her name and number. “So…can I call you?” he asked. “I’d love to catch up and it looks like neither of us are free at the moment.” He nodded at the table behind her. Rosalee hesitated. Why shouldn’t he call her? Her too-slow brain fired off a million reasons starting with “he’s a lying liar.” But somehow, with the words “I don’t think so” poised on her tongue, another part of her realized that particular wound wasn’t…so much of a wound anymore. It didn’t hurt, it wasn’t tender. It was more of a scar really. So the question really was…why not? It’d been a long time since she’d thought about George Bowen, and she found that her overwhelming thought was simply curiosity. Okay, and maybe, perhaps a slight flush of warmth because good grief, that man was still too good looking for his own good. He started to reach out as thought to touch her hand or shoulder, but she took a very tiny step back. She may not have been hurt anymore, but she hadn’t seen George in decades. She wasn’t ready for that easy familiarity. He must of read her signals because he quickly dropped his hand and settled for another heart-stopping smile. He seemed sincere, Rosalee thought as she watched him walk toward his table, but then again, he always had. She turned away from the crowded restaurant and back to her table, where the ladies were doing their best not to act like anything interesting had just happened. Rosalee sat down, placed her napkin in her lap, and took a bite of her pizza. She chewed, swallowed, and took pity on her friends. It's been a while since I've picked up a Christian fiction book, mostly because -- as happens with any genre -- my favorite authors haven't been writing much, and I haven't had much luck with most of the authors I've picked up. Plus, as I've mentioned before, my reading tastes have developed to a place where I value story before message and Christian fiction is a genre in which not every author writes that way (which is not bad! just not usually my particular cup of tea these days). 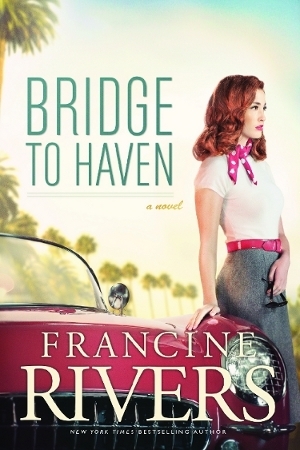 Anyway, I was at the library and came across Bridge to Haven by Francine Rivers on the new book shelf. It's been a while since I've read anything by Francine Rivers, and while I do remember that her books are very much about the message, I also remember really enjoying them. So I picked it up. Bridge to Haven is a story about self-worth, and the lengths at which people often go to find it. It's about love, family, and forgiveness. Abra is abandoned under a bridge on the day she's born, and taken in by the family of a local pastor. Pastor Zeke's wife Marianne dies while Abra is still very young, and Zeke decides to let another family adopt Abra because he doesn't think he and his 12 year old son Joshua can take care of her well enough by themselves. Of course, 5 year old Abra doesn't understand, and spends many years felling abandoned, second-best, and blaming herself for Mama Marianne's death. She builds walls between herself and her new family, only allowing herself to open up with her piano teacher Mitzi and with Joshua. When a smooth-talking, handsome, and glamorous young man comes into town, 16-year old Abra runs off with him. She quickly realizes that what he's offering isn't exactly everything she imagined, but her pride and self-doubt keep her from returning home. Several years later, Abra -- now known as Lena Scott -- is a rising movie star, and hates every second of it. Joshua is a Korean War veteran building homes in Haven, and one of the many people who pray every day for some word from Abra, some sign that she's okay or better yet, coming home. Despite hitting dead end, after dead end in a search for Abra, a series of seemingly random circumstances finally bring Joshua and Abra together again. I didn't love Bridge to Haven, but I did enjoy it. Rivers writes very compelling characters, and I kept reading to find out what happened to them. My primary complaint is that I think Rivers' somewhat heavy-handed message kept her from exploring more with the side characters. Joshua was the most fleshed out secondary character, and I think his role in the story kept him a little too perfect and a little too one note. We did get to read some about his experiences in war and his difficulty adjusting back home, but just a touch more of that would have made Joshua a richer character and a little less "too perfect." Bottom line: if you're in the mood for well-written Christian fiction with a strong message, an interesting story, and compelling characters, you can't go wrong here. It's frustrating how difficult it is to get into a habit, but how easy it is to get out of it. One little change in routine or schedule and there you go: derailed. For me, this is particularly true of things I do that don't affect anyone else. Writing, exercising, studying. Now that I'm not playing music for church anymore, I find myself going...way to long between sessions at the piano, then I find myself thinking "something is missing", and I eventually sit down and even just playing a few songs feeds that particular music-shaped place in my soul. But when no one is watching or waiting or counting on me to write a chapter of my novel, or put running shoes to pavement, or play a song or three, it's easy to just do something sporadically that I'd ideally like to do much more regularly. Maybe that's why I'm rambling about it here. Getting the thought out of my head. Telling myself in a more concrete way to spend less time mindlessly clicking links to articles people post on Facebook*, and just a few minutes a day writing or playing. Just a few minutes. Which some days turns into more, and some days is about all I can handle. *Don't get me wrong, sometimes I read really cool stuff that other people link to, but man, can that a black hole. I, like so many people, love fall. Maybe because I have a fall birthday, maybe because I grew up in the Midwest (where fall is lovely and perfect). Regardless, it's probably my favorite time of year, and I love many things about it: the weather, the smell in the air, the color of the leaves (when I'm able to see them), pumpkins, apples, cinnamon, spice, back-to-school, football, fires, boots and scarves and sweaters (not so much in South Texas, of course, but I've been known to rock boots, short sleeves, a skirt and a scarf when I can. It's all about adapting fall traditions). Basically, I think the Anne of Green Gables books are perfect for any time of year, but these two books in the series are especially well-suited to fall, because they both have a school setting. Anne of the Island being Anne's college years, and Windy Poplars telling the story of her years teaching at a private girls' school while Gilbert finishes medical school. Two things make this a perfect fall book in my mind: the Midwest and football. Dairy Queen is the first of a fantastic trilogy about D.J. Schwenk, the daughter of a dairy farmer, the sister of two all-star football players, and a darn good athlete on her own. It's part coming of age story, part romance, part sports story, and 100 percent fantastic. This is the first book in Stiefvater's Mercy Falls trilogy (well, kind of a quartet now). It's set in the Midwest, and cold weather is practically a character. 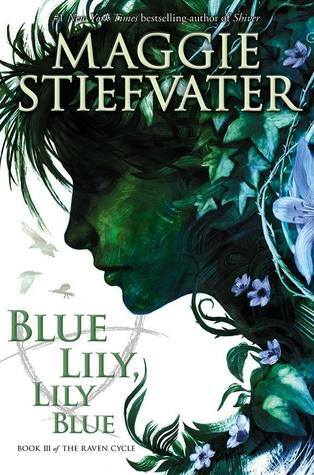 It's a supernatural teenage romance, which isnj't for everyone, but Stiefvater is a fantastic, lyrical writer. A secondary fall recommendation would be The Scorpio Races, with its haunting tone and vaguely British Isles setting. This surreal book has witches, magic, sisters, family, romance, and a moody atmosphere that is also perfect for reading by firelight (or just turn the lights down low if you're climate is too hot for a fire 364 days out of the year). You can check out my expanded thoughts here. 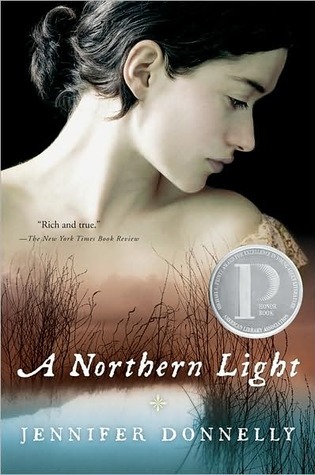 A Northern Light is the story of a girl who lives in rural New York during the turn of the 20th century, a girl who dreams of leaving her small community to study, write, and explore the world outside of the woods. But Mattie's mother is dead, her older brother left home, and her responsibilities to the rest of her family seem like a life sentence. Mattie is ready to make the best of it -- to give up her dreams in favor of marrying the handsome Royal Loomis and making a life as a farmer's wife. It many would be a good life...but not the life she had planned. Royal doesn't understand that part of Mattie that reads anything she can get her hands on, that writes any chance she gets, that plays vocabulary games and loves learning. As Mattie wrestles with the conflict between her dreams, the realities of poor, rural life, and societal expectations, she takes a summer job at a swanky hotel up on the lake to earn money for her family and in expectation of marrying Royal. But during the murder of a young girl shakes up everyone at the hotel, perhaps Mattie most of all. I've read one other book by Jennifer Donnelly (Revolution) and I absolutely love how grounded her books are in their time period. Donnelly manages to paint a very rich picture of whatever place and period her characters are in, from the dirty and messy realities of life to the poignancy and beauty found in every day. Her characters are layered and very real. Their hopes and dreams are timeless, but the limitations they face put the story firmly in its unique time period -- from Mattie's best friend Weaver's struggles as a young black man in 1907 to the amount of effort it takes for a poor white woman to dream bigger than her back yard. I'm not going to lie, there is a lot of sadness and hardship in A Northern Light. But there is also a thread of hope that runs through the story, mirroring the sadness and joy of real life. Bottom line: if you like grounded, realistic historical fiction you can't go wrong here. And if you're typically not a historical fiction fan, but like books with rich characters, and a story of struggle and hope, give it a try.